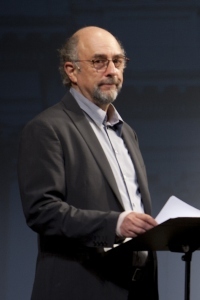 Photo of Richard Schiff at Wil on the Hill 2012 by Margot Schulman. Richard Schiff and Doug Hughes are busy men. Schiff (Emmy Award® winner for his work on The West Wing) just performed on Broadway in Glengarry Glen Ross with Al Pacino. Hughes (Tony Award® winner for Doubt) recently finished directing An Enemy of the People at Manhattan Theatre Club and is set to tackle The Big Knife at Roundabout Theatre Company this spring. In between, they have teamed up for the Shakespeare Theatre Company’s production of Eugene O’Neill’s Hughie. STC sat down with them to hear about the birth of this passion project. Shakespeare Theatre Company: How did this production come about? Richard Schiff: Last year I was asked to be part of Will on the Hill [an annual STC benefit featuring members of Congress and Washington VIPs performing a mock-Shakespearean play]. It was the cutest I’ve ever seen politicians. Some of them went full hog with the acting, and others were nervous and shy. It was adorable. Afterward I was standing outside Sidney Harman Hall, and I noticed the poster for [O’Neill’s] Strange Interlude. I was talking to [STC Managing Director] Chris Jennings, looking at this poster, and I mentioned how I’ve always been fascinated by Hughie. That’s how it started. I knew Doug, and I immediately thought of him. Doug Hughes: I did a production at STC of The Little Foxes with Elizabeth Ashley a decade ago. It was a wonderful experience. Hughie has been on my list for a while. I had heard about Michael’s remarkable production of Strange Interlude, and I’ve always been fascinated by the plays of O’Neill other than Long Day’s Journey Into Night or A Moon for the Misbegotten. I also think that the Lansburgh Theatre is perfectly sized for Hughie. Neil Patel, who I’ve worked with for a long time, is designing the set. RS: Neil also designed for In Treatment on HBO, which is a show that I directed. DH: That’s right! With Gabriel [Byrne]. STC: Doug, you directed Gabriel in O’Neill’s A Touch of the Poet [at Roundabout in 2005]. 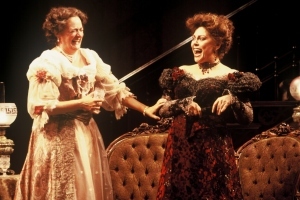 Photo of Nancy Robinette and Elizabeth Ashley in STC's 2002 production of "The Little Foxes," directed by Doug Hughes, by Richard Termine. DH: Yes, he was a great Con Melody. These late plays by O’Neill share persistent themes: they’re all about the human being’s inability to face the facts about their lives, and all the remarkable, destructive, funny things they do to avoid getting hip to themselves. Hughie is another beautiful example of O’Neill’s clear-eyed genius. STC: Richard, what drew you to the role of “Erie” Smith? RS: There’s something very heartbreaking and poetic about Erie Smith. I think we all live in pipe dreams sometimes in varying degrees. I’m interested in exploring his solitude, that way we feel when we end up in this place and just want to connect. Here’s a guy who is bereft of connection—of love, really. His one love affair in life was with Hughie. It’s tough for him to admit. That’s why he’s always saying, “You know, we weren’t really pals,” but he really loved him. Hughie was the one person in his life who gave him a sense of importance or relevance, and now he’s just lost. I think that’s why it touches us. STC: It’s one of those roles that an actor dreams about. RS: Or has nightmares about, depending on where you are in the rehearsal process. [Laughter] We’re in New York right now. Working on Broadway and walking to Doug’s office, we’re in the neighborhood that O’Neill was writing about, in the theatre district. You ride the subway and you see all these faces fixed, looking forward, no fluidity in them. They could be sculpted, they’re frozen in their moment. I look at this play as a Rembrandt. It captures so vividly these people. There is blood flowing through their veins. They’re alive. Their story is all there in the eyes. This play is a beautiful little portrait, of this guy that we would never notice otherwise. DH: This is one of the great features of this play, this intense scrutiny of what is ordinarily ignored. After completing Long Day’s Journey, O’Neill mapped out an entire cycle of plays. The collective title for them was going to be “By Way of Obit,” and in each one you were going to meet someone who was recently bereft of somebody crucial in their lives. They were all going to be two-handers. In Hughie, Randall Newsome, whom I’ve worked with a great deal on Broadway, is playing Charlie Hughes, the “replacement” night clerk for Hughie. You learn about Hughie, the deceased in the play, you learn about Charlie, a stranger to the protagonist, and you certainly learn about Erie, the aggrieved one. And what a beautiful notion that was, and what a shame that this is the only one that O’Neill did not destroy. DH: That they are. You know, O’Neill was known for his stage directions, but in this play they go beyond adjectives and adverbs and become a marvelous part of the composition. At the moment, we are thinking of treating the audience to some of this special knowledge that O’Neill discloses to the reader. I’m interested in using fluid imagery. There’s a way in which O’Neill expands time in the play in order to look at things from a variety of angles. In the second volume of Louis Sheaffer’s terrific biography, Eugene O’Neill: Son and Artist, O’Neill said to [critic] George Jean Nathan that he dreamed of a form of theatre that could incorporate all of these elements—the voice that one hears in the stage directions, the images that haunt these men. RS: He was the forerunner of the Annie Hall moment on the balcony, with all the subtitles. STC: Richard, when we announced this show, we got countless emails and phone calls. You are a demigod in Washington, for your role as Toby Ziegler on The West Wing. STC: Do you have a favorite Washington story? RS: I was at a cocktail party one year, after the Correspondents’ Dinner. I looked over and there was General Alexander Haig, just staring at me from across the room. He has this old soldier’s gait, and he walks up to me in a straight line. We were eye to eye, nose to nose. And he took his fist, pointed at my face and said, “I find your show eerie.” And I just said, “Thank you, General.” I never quite figured out what he meant. STC: That’s perfect for Hughie, because you’re playing Erie in the show. RS: There you go. I didn’t think of that. Speaking of which, I gotta go, because I gotta go down to the track and make some bets.